Did you know that grass acts as a natural air filter? Most of us are probably ignorant and don’t realize the myriad benefits of tending to our lawns. Healthy grass plays a vital role in preserving the environment to ensure your well-being. It does a fine job of getting rid of damaging air pollutants, trapping dirt, and minimizing health impacts from dust and smog for improved air quality. On a typically windy day, clouds of windblown dust can cause reduced visibility, and irritate your eyes. However, in the presence of grass, the dust particles settle on the turf trapping all irritants and dirt it can possibly hold. According to research, grass is known to increase the life span of senior citizens, help in faster recoveries from injuries, and lower stress levels. Grass also has a calming effect on children coping with attention disorders. Summer can be a difficult time for your grass to withstand, and it’s imperative that you do what’s best to make sure it stays healthy. Summer lawn care is about making sure your lawn is well-hydrated and well-nourished while temperatures are soaring and rainfall is a far cry. Resist the urge of cutting your lawn too short which is a common mistake made by homeowners and landscape companies. When the grass is cut too short, it hampers the plant’s ability to produce energy that’s crucial for its growth. Grass grows stronger roots that can tolerate higher stress levels when cut to the proper height. Take note that cool- and- warm-season grasses demand different maintenance techniques and cutting heights. Since they have varied growth habits, you can’t go with a standard cutting height for all grass types, and that’s why it becomes important to be alert. Make sure you don’t cut more than one-third of the grass at a time. This helps keep the grass cooler since the amount of plant tissue removed is minimal. 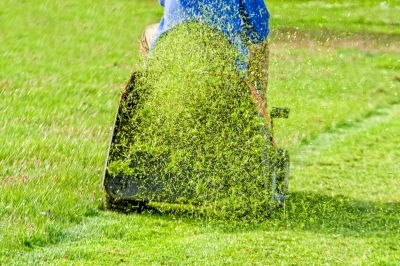 If you’re working with cool grass, setting the blade higher will prove beneficial even in the scorching heat of summer. 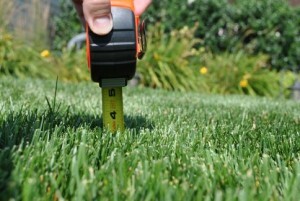 Nonetheless, it’s a good idea to understand the specific height requirement for your grass to reap maximum benefits. Taller grass provides shade to the soil, which reduces water from evaporating and prevents weed seeds from germinating. Make sure you do a thorough read-through of the owner’s manual from start to finish. At the end of each mowing season, make sure you drain old gasoline to rule out starting problems. Monitor the oil level frequently and clean up any floating debris or oil that’s blackish in color. 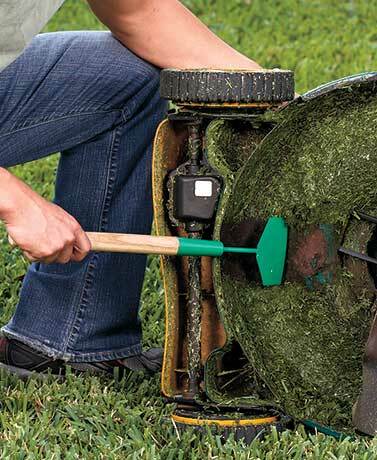 Clean the undercarriage to get rid of grass that gets caked in and can clog the mower’s discharge chute. Inspect the air filter frequently and do an annual replacement for optimal performance. Change the spark plug annually for the best results and leading to an easy start. Go for a mower tune-up to sharpen the mower blades effectively. Hire experts for a professional tune-up to make sure your mower is in top working condition. Instead of dumping your grass clippings, which is probably going to just land up in an overfilled landfill, it’s time to put it to better use in your yard. 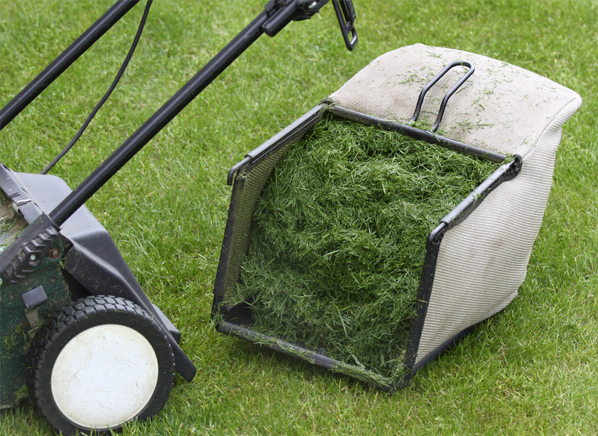 Did you know that when you remove the grass clippings each time you mow, you’re ridding the grass of essential nutrients? It’s a good idea to uniformly spread the grass clippings on the lawn that will nourish the grass and restore 25% of its nutrients. They act as natural fertilizers for the plant as they decompose. Grass clippings also attract beneficial microorganisms, like earthworms, to maintain your grass’s health. However, make sure that the clippings aren’t too long because they won’t break down easily and would hinder the appearance of your lawn. You also need to check if the lawn is unhealthy or has weeds growing before spreading the grass clippings inviting bigger problems if not addressed in time. Don’t bag your grass clippings unless they are near storm drains or water bodies, which could pollute lakes and streams because of nutrients released from decomposing leaves. Taking care of your lawn is good practice, but overdoing it comes with side-effects, especially during the hot summer months. During summer, cool-season grasses consume more than they produce; fertilization will promote growth that can cause more energy consumption putting your grass through a lot of stress. If you’re considering cultivation, like dethatching and aerification, resist the practice of imposing aggressive practices. Too much stress can prove harmful for your turf causing temporary damage during the hot summer months. Since your lawn gets maximum traffic during summer, you might think it deserves more fertilizer. However, you shouldn’t fertilize grass in the peak of summer because fertilizer without water can burn through the grass causing irreparable damage. Also, don’t fertilize them when they are in the dormant stage. 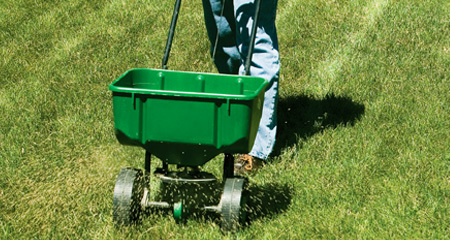 Warm-season grasses grow relentlessly during summer and they need good-quality fertilizers to keep them in good health. They benefit from a nutrient-rich fertilizer enabling them to grow a lush, dense turf. However, cool-season grasses shouldn’t be fertilized in summer when they are dormant, and fertilizing them can lead to watershed pollution. Use a fertilizer that has a 32-0-4 mix, which is the preferred consistency with the right distribution of nitrogen, potassium, and sulfur. This helps strengthen grass blades throughout summer helping them rejuvenate and recover from heat and drought. Keep an effective herbicide handy to get rid of weeds without harming the grass. If you notice fungal growth, use a fungicide; grub infestations can be tackled with a fertilizer that has grub control. On an average, lawns need at least one inch of water every week and more when it’s really scorching hot. When lawns are dealing with extreme heat conditions, they resort to drawing moisture from the leaves. When the turf wilts, it turns brown and footprints are left behind when walked on. 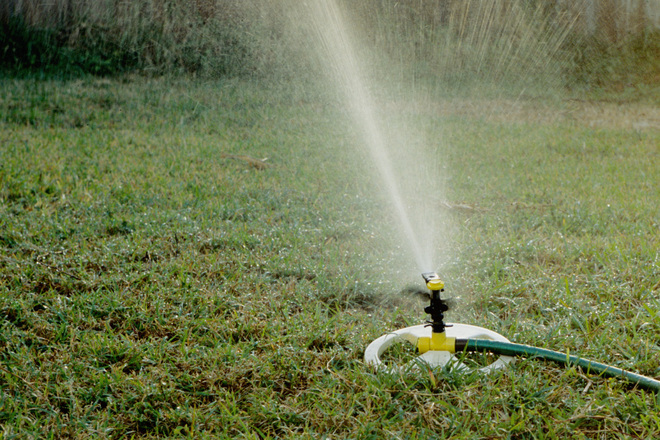 This is a sign that your lawn is dehydrated and needs frequent watering to keep it in great shape. 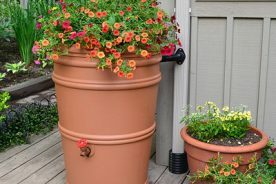 When Is the Right Time to Water? Watering your lawn early in the day will minimize fungal growth and reduce evaporation. Make it a practice to water regularly and deeply to promote healthy growth. Don’t let the grass go dormant, but if it does, let it stay that way until fall. 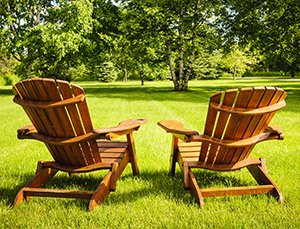 Once the weather changes, your lawn is likely to bounce back to health. Don’t over water your lawn or you’ll ruin them for good. Frequent light watering your grass leads to shallow roots causing trouble during summertime. Neither is it a good idea to run the sprinkler all night which provides the right conditions for disease. Kentucky bluegrass tends to go dormant in drought-like conditions and bounces back to health when it rains. Augustine, Bermuda grass, and Zoysia, which are warm-season grasses, thrive in summer giving rise to deep, strong roots that can withstand drought efficiently. Tall Fescue with its deep roots has the highest drought resistance in cool-season grasses. To sum it up, warm-season grasses require 20% lesser water than cool-season grasses. Sandy soil absorbs water fast and quick and needs less water in frequent spells. Loamy soil absorbs water evenly without the occurrence of runoffs or puddles. Clay-rich soil absorbs water slowly and holds it for longer periods. However, they can cause runoffs if watered too quickly. Overwatering your lawn can cause a shallow root system making it more susceptible to infestation from insects and diseases. Too much water can accelerate the growth of weeds which could make your lawn unsightly. When you overwater your lawn, you’re pushing oxygen out of the pores and depriving the roots of oxygen causing them to suffocate. Water when needed. Overwatering attract grubs, since beetles prefer moist soil to lay eggs. This is one reason you shouldn’t set up automatic sprinklers and later forget about it. You’re just wasting water and causing undue damage to your lawn in the process. Summer brings with it a trail of pests besides increased heat and humidity concerns. There’s nothing like owning a dense, lush green turf which can make your landscape look appealing and inviting. However, unruly pests can threaten your lawn making in sickly and disease-prone. Take time to understand the kind of pests and how they can damage the health of your grass if not tackled in time. Sometimes, you can get rid of them by pouring soapy water which drives pests out from their hideout to the surface. However, a smarter approach would be to hire a professional pest control agency to get rid of bugs and critters from the ground up. Also called beetles, white grubs are the most destructive, which are the larvae of scarab beetle that includes Japanese beetle. 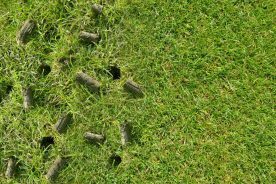 Grub damage are evident if you notice wilted grass blades and brown patches on your turf, which eventually give way to the grass dying. You’ll also notice that the lawn is spongy and crows, moles, and skunks are feeding on your grub-infested turf. These feed on turf grass and eventually transform into moths. Young ones feed at night and stay hidden during the daytime in their silken burrows; adults metamorphose into moths. These worms feed on grass blades causing brown patches in the lawn. Birds foraging for these pests leave behind holes on your turf. They can turn a perfectly healthy lawn from lush to sickly before you even know it. Depending on their type, these pests can be yellow, pink, or gray in color. They eventually turn into brown-colored moths with furry abdomens. They are known to skeletonize leaves, and devour on grass blades and stems, and you might spot them feeding on your grass during the day, evening, or at nighttime. While armyworms are at it, they leave behind circular bare spots in your lawn. These devastating insects tunnel through the soil and feed on decaying plant matter, grass roots, and shoots. If your turf is infested with mole crickets, they will feel spongy to walk on and will also show irregularly shaped brown patches. On sighting finger-width tunnels and dying grass would mean that mole crickets are at work. They resemble an oversized mosquito and are commonly sighted on lawns or flat walls of your home. 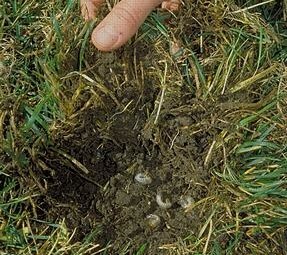 Leatherjackets, which are the larvae, fall on the grass once they hatch and feed on the grass roots making them weak. This happens when Rhizoctonia blight (fungi) is active in wet grass when temperatures are about 80 °F to 90 °F. 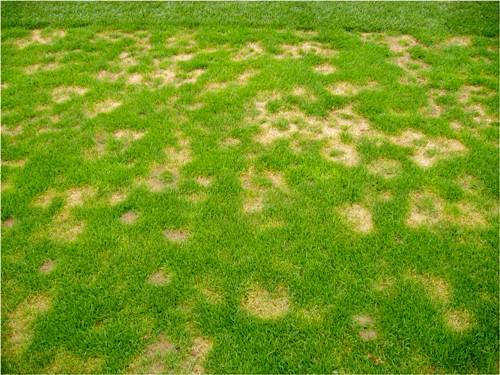 Look for brown, circular patches several inches in diameter to identify brown patch disease. 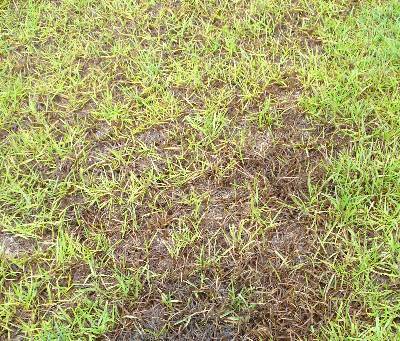 This disease infects and destroys grass roots and is caused by a fungus called Magnaporthepoae. In the hot summer months an infected lawn would appear wilted and straw-brown in color. This appears on compact, shady, or less fertile lawns in hot, dry climate. Keep a watch for small, yellow flecks which later grow pustules that release red, orange, or dark brown spores which will rub off when touched. Fungicides work great in treating brown spots. To make sure you get the best results, make sure you apply them as soon as you notice the symptoms. Do this when the temperatures are within range of disease activity. Make sure you read the product label carefully to understand the frequency of application and the best practice. Prevention is better than cure always; however, if you have surpassed that stage, killing them would be the only option. A good-quality herbicide can do the job effectively. Depending on the kind of weeds you’re dealing with, you can choose between liquid or granular herbicide. Too much foot traffic can breakdown brittle grass crowns and eventually damage your lawn. Excessive trampling can make the soil hard and compact. A good idea would be mow the lawn tall; keep it well irrigated, and aerate the lawn in spring and fall to keep the soil loose and stabilize the oxygen levels. Lawns are highly beneficial for residential and commercial properties alike. Healthy, vibrant lawns increase the market value of your property and its stability. 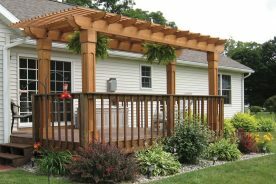 According to a survey, the investment recovery rate is gauged to be around 100 to 200% for landscape improvement when compared to a functional deck or patio with a 30 to 70% recovery. What’s more? The soil microbes and root masses of lawns are fantastic filtering agents. They capture and break down pollutants in the environment and increase the quality of life. It’s time to invest your time and effort in a great looking lawn right away!